Water views, sunshine and lots of “aloha” vibes set the stage for the Hawaiian-inspired menu. : In a former fish ‘n’ chips shack, Ma Kai (meaning “by the sea”) retains the casual nature of its ancestor, but with an infusion of “aloha” from fresh coats of brightly colored paint. The real visual draw, however, is the expansive view of downtown Seattle. 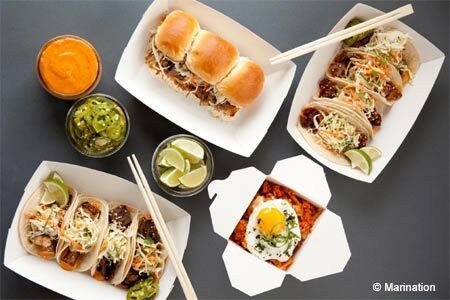 It’s almost enough to distract a diner from the vividly flavored bulgogi tacos, Spam sliders (don’t knock ’em ’til you’ve tried ’em), kimchi quesadillas, and other Korean and Hawaiian inspired casual food that may be ordered at an interior counter. Even the fish ‘n’ chips (a must for any seaside spot) comes with an East-facing twist: miso-ginger tartar sauce. Around the corner, a bar serves local beers on tap and tropical-themed cocktails, including alcoholic versions of the classic Hawaiian treat, shave ice.